-	From the publishers of The Overstreet Comic Book Price Guide! 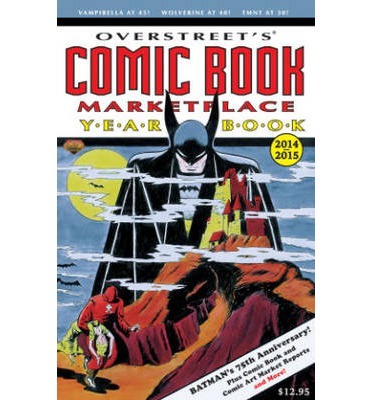 Oversreet's Comic Book Marketplace Yearbook 2014-2015 features a special look at Batman's 75th Anniversary ranging from the first year he spent without Robin to Gotham By Gaslight, and from his Silver Age revamp to DC's "New 52." The spotlight also falls on the 60th Anniversary of Simon & Kirby's Fighting American, the 45th Anniversary of Vampirella, 40th Anniversary of Wolverine, the 30th Anniversary of the Teenage Mutant Ninja Turtles, and the 20th Anniversary of Billy Tucci's Shi. CBM expands to look at the comic art and back issue market.